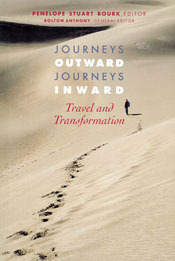 Editor, Compiler, Contributor, Journeys Outward, Journeys Inward: Travel and Transformation, ed. Penelope Stuart Bourk, Second Journey Publications, September 2013. 208 pp. A collection of essays and poetry about senior travel and change contributed by 24 older authors from the U.S., Canada, and France. Editor, Compiler, Contributor, Odysseys for the Soul: Travel and Transformation, Itineraries webzine, Issue 2013, No. 1, www.secondjourney.org, about conscious aging, dedicated to "mindfulness, service and community in the second half of life." This issue was later expanded, creating the book cited above.